All makeup clients receive complimentary lashes and a touch up kit that includes blotting paper and sample lipstick so all you need to do is book and you're done. Includes complimentary false lashes if required. $50 Junior bridesmaids 6-12 yrs old. Flowergirl 2-5 yrs old complimentary. $30 call out fee for all mobile bookings. Wedding consultations/trial are conducted in our home studio in Richmond 5033. It is a great opportunity to discuss your wedding in detail and try out your desired makeup look and make any adjustments as necessary to make sure it is just right for your wedding day. We appreciate having the correct amount payable at your trial as we do not have any eftpos facilities. If you prefer to pay by bank transfer this can be done before your trial. Please notify us beforehand if you are sensitive or allergic to any ingredient/products so that arrangements can be made beforehand. There is a call out fee of $30.00 for all bookings on location, which includes travel up to 20km's from Richmond 5033. Any Km's thereafter is charged at $1 per km one way per artist. Individual clients are welcome to come to our salon in Richmond for their makeup to avoid the call out or any travel fees. All CBD/hotel appointments incur a $20 fee to cover parking/valet costs etc, if free parking cannot be arranged by the client. This ensures we are parked close and can start service straight away rather than wasting time looking for free or faraway parking. Any appointments starting before 6am will incur a $50/hour fee. To book a non refundable/non transferable booking fee of 50% of the total balance along with the return of a signed, completed booking form is required to secure your date. The remaining balance must be paid 2 weeks before your event and must be received no later than 7 days before your event otherwise it will be considered cancelled by the client. Please note peak wedding seasons occur between August to April and dates around these times book out very quickly so It's best to book as early as possible to avoid any disappointment. We do not hold dates or take tentative bookings in any cases without a booking fee, consultation/trial appointments do not hold or guarantee your date. Whoever gets their booking form in and pays the booking fee first will get the date as we unfortunately cannot chase up enquiries and assume if we do not hear back then our services are no longer required. It is the responsibility of the client to make sure everyone requiring services is on time and available for services. We will not be responsible if the desired completion time is not met due to wedding party delays and reserve the right to refuse service(s) if it compromises our finishing time or subsequent appointments. All brushes used are carefully disinfected and sanitised between each client to prevent cross contamination. It is the client’s responsibility to notify us of any contagious illness or infections they may have, such as but not limited to; Cold Sores, Conjunctivitis, air-borne illness, or skin infections prior to commencement of service. We will use disposable applicators where necessary and in some cases reserve the right to refuse service if it means putting our or any other client’s health at risk. Payments of all Obsessed with Beauty services are non refundable or transferable. If the client is dissatisfied in anyway, the onus is on you to notify us as soon as possible while still on location so that it can be rectified straight away. Any cancellations or changes must be notified in writing. In the rare event of serious illness or unforeseen circumstances we will endeavour to arrange a suitable hairstylist in replacement or alternatively refund your booking fee if you would like to find your own stylist. ​How many years have you been in the Industry? I did my first short makeup course at TAFE in 2006 and from there decided I wanted to study beauty. 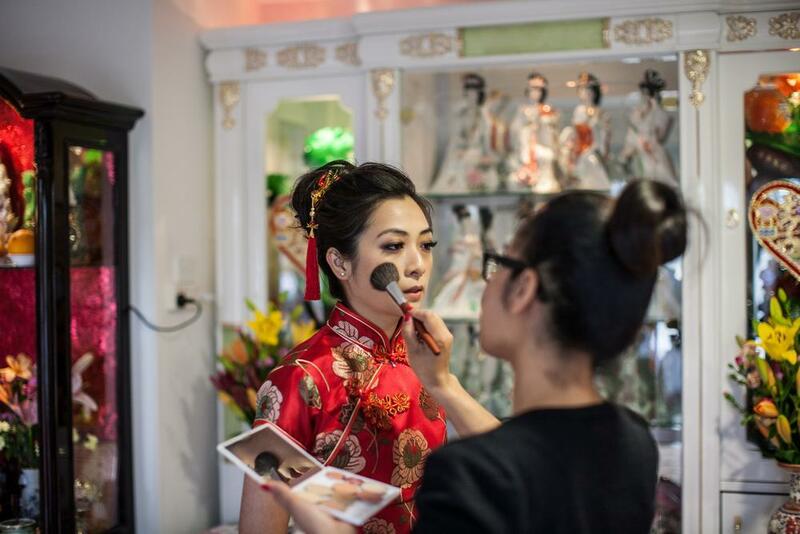 After completing my CERT III beauty in 2007 which also included a makeup component I travelled to Asia in 2008 and studied Asian hair and makeup, where I got my excitement for weddings after seeing such colourful brides and elaborate weddings! This ignited my passion for weddings so I enrolled into the bridal specialist hair and makeup course and airbrushing course at The Face Agency which I completed in 2010. In 2011 I concentrated on working with photographers to build my portfolio and extra studying from books, workshops and classes to improve my techniques. In January 2012 I finally decided to follow my passion and officially started my Adelaide bridal hair and makeup business Obsessed with beauty. Why should I book a professional makeup artists for my wedding day? Weddings can be stressful so hiring a professional means you can relax and be pampered on your day knowing someone else is in charge of making sure you look absolutely gorgeous all day, not only in person but in photographic memories for years to come! Although trials are not compulsory they will minimise time and stress on the day of your event or worse not getting the look/style you are after in the allocated time. This is why I strongly recommended one before any big event and for your own benefit and piece of mind. Having a full consultation and practice run ensures you look exactly as you pictured and helps the day run smoothly without any added stress on your big day. Bridesmaids and mothers of the bride/groom who have trouble skin or hair are also welcomed to have a trial for piece on mind. Trials are recommended between 1-3 months before your wedding so that your skin is as close to what they would be on the day. Makeup trials take around 1.5 hours, please come with a freshly washed face with no makeup on at all and some inspiration images. Full instructions for makeup prep will be given once you make your trial booking. How much time will you need on the day of the event? I like to allocate an hour per person for makeup with an extra 30 mins to an hour at the end for touch ups, and packing up. This provides a relaxing environment to get ready, with enough time for skin prep and ensures everyone looks as beautiful as they can. Can you do both our hair and makeup for my wedding? Yes, I can do both hair and makeup for smaller bookings if you are happy with the allocated 2 hours per person, however being a sole trader, I do all of the work myself without any help or assistant so for bigger parties I suggest hiring a separate hair and makeup artist to ensure less waiting around time and finishing twice as fast than one artist doing both. Yes, however the usual minor touch up of lipstick/gloss and gently blotting oil from your face may be needed and is provided in your touch up kit. A full size lipstick/liner can also be purchased from me if you would like the same colour to use beyond your wedding day. Also remember, if you cry gently dab the tears away, don't wipe!